The nature of dark matter has stumped astronomers for decades, so now they're turning to the masses for help. 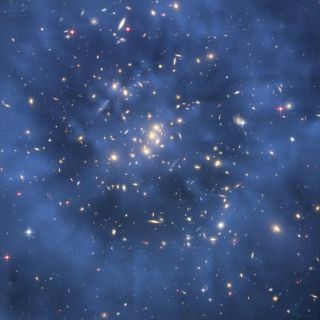 Scientists have launched a public competition in an attempt to better understand dark matter, the mysterious stuff thought to make up 83 percent of all matter in the universe (the rest is the "normal" matter that makes up everything we can see and touch). Despite its prevalence, dark matter cannot be detected directly, only sensed through its gravitational pull. The contest organizers — which include astronomers from the University of Edinburgh, the crowdsourcing website Kaggle and British investment firm Winton Capital Management — hope thousands of people will take up the challenge using a variety of techniques. Participants may be drawn in by more than just pride or the desire to advance scientific knowledge. Winton is offering prizes of $12,000, $5,000 and $3,000 for the competition, which is known as Observing Dark Worlds. Astronomers know that dark matter causes galaxies to form huge clusters in space. Observing Dark Worlds asks participants to develop ways to analyze pictures of these galaxy clusters taken by NASA's Hubble Space Telescope. The goal is twofold — to better understand how the clusters formed and to create a detailed map of dark matter distribution, both of which could yield key insights. "Winton is delighted to support this competition because understanding dark matter is one of the great scientific challenges of the 21st century," said David Harding, Winton’s founder, chairman and head of research. Researchers expect the contest to attract people who have experience organizing or analyzing large datasets, such as scientists, statisticians and engineers. A better understanding of dark matter could come by adapting techniques or knowledge outside the field of astronomy, organizers said. "Competitions bring together an array of the brightest individuals around the globe, and focus them on challenging problems," said Kaggle data scientist Ben Hamner. "We’re excited to leverage this capability to attack some of the most fundamental questions in astronomy." If you're interested in throwing your hat in the ring, visit www.kaggle.com/c/DarkWorlds for more details about the contest. Entrants have until Dec. 16 to submit their ideas.